324 pages | 32 Color Illus. | 194 B/W Illus. 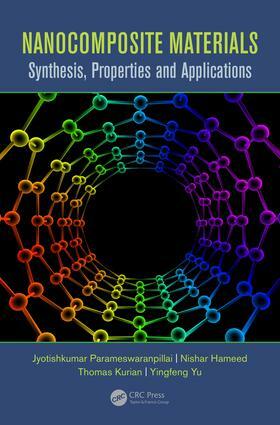 This book provides a comprehensive collection of the latest information on nanomaterials and nanocomposites. It covers material synthesis, processing, structure characterization, properties and applications. It presents a coherent treatment of how composite properties depend on nanostructure, and covers cutting-edge topics like bionanocomposites for sustainable development. This book summarizes many developments in the field making it an ideal resource for researchers from industry, academia, government and private research institutions. Introduction to Nanomaterials and Nanocomposites. Nanomaterials. Classification. Synthesis. Optical Properties. Microscopy. Mechanical Properties. Nanocomposites. Preparation. Morphology. Thermal properties. Electrical properties. Optical Properties. Rheological behavior. Mechanical Properties. Application. Dr. P. Jyotishkumar and Dr. Thomas Kurian are affiliated with the Department of Polymer Science and Rubber Technology at the Cochin University of Science and Technology in India. Dr. Yingfeng Yu is affiliated with the Department of Macromolecular Science at Fudan University in China. Dr. Nishar Hameed is affiliated with the Institute for Frontier Materials at Deakin University in Australia.